See Marvel completely destroy Donald Trump. A devastating caricature of the presumptive Republican nominee. Despite constantly being destroyed by John Oliver, Stephen Colbert, and even Samantha Bee, Donald Trump continues shitposting his way toward the presidency, gleefully encouraging the most despicable people in the alt-right to take their rightful place in the vanguard of the Republican Party. But now Marvel Comics is getting in on the anti-Trump action, so the ugly strains of thought Trump is legitimizing and empowering will undoubtedly start to crumble. The probably-fatal salvo is found in Spider-Gwen Annual #1, currently in stores, written by Jason Latour. One story features a recognizable Donald Trump as a version of longtime Captain America antagonist MODOK. 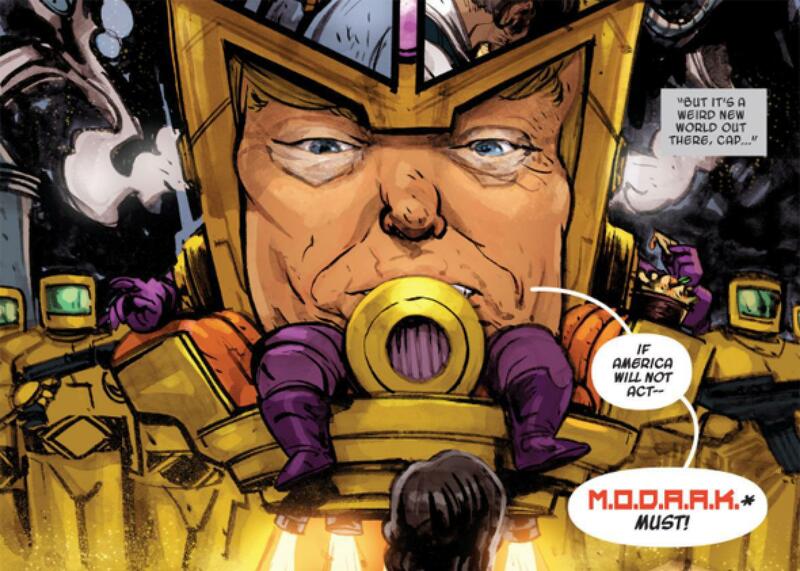 The original MODOK is an acronym for Mental Organism Designed Only For Killing, but the Spider-Gwen Annual’s droll Trumpified version is M.O.D.A.A.K. : Mental Organism Designed As America’s King. Besides Trump’s puffy eyes and trademark orange complexion, M.O.D.A.A.K. can be identified by his characteristically tiny hands. In the alternate universe of the Spider-Gwen comics, Peter Parker’s girlfriend Gwen Stacey has the spider powers and Captain America is a black woman; naturally, the racist supervillain gets clobbered by Cap, which will hopefully inspire millions of Donald Trump supporters to go home and think about what they’ve done. In all seriousness, it’s clearly better if Marvel (and Oliver, and Colbert, and Bee) treat Trump and his ideas as un-American, racist garbage as often as possible. But if Captain America comics were enough to delegitimize the evils of American racism, anti-Semitism and fascism, they would have done the job back in 1941, when Cap punched out Hitler on the cover. The power to truly destroy the worst forces in our nation’s culture and politics lies not with comic book writers or talk show hosts, but, as we all know, with Slate culture bloggers. So. Um. “Donald the Doofus,” maybe?